Miesha Tate isn't being affected by the aura of Ronda Rousey. By the time Miesha Tate steps into the cage against Ronda Rousey on Saturday, December 28, the odds makers in Las Vegas will likely have her as one of the largest title underdogs in UFC history. Currently, Tate is a +650 underdog to Rousey, who comes in as a massive favorite at -1000 and those are still likely to change with ten days left until the fight takes place. To put that number into context - Stephen Bonnar, who stepped in on short notice in 2012 to face Anderson Silva in the main event of UFC 153 in Brazil, saw his opponent as a huge -1100 favorite, which at the time was the largest in UFC history. Rousey could share those same odds by the time the fight with Tate starts next Saturday night. There’s little debate that Rousey has earned her spot as the favorite in this fight. She’s never fought out of the first round and every, single opponent she’s faced has either tapped or watched their arm snapped as a victim of her vicious, signature armbar. Tate knows that feeling as well because she’s one of the fighters on Rousey’s list of armbar recipients, and when you add in the fact that she’s coming into this bout off a loss to Cat Zingano earlier this year, it starts to make sense why she’s such an underdog. I know what we’re both fighting for that same common interest. We want to beat the hell out of each other, we want to finish the fight, we don’t want a decision. The only person who doesn’t seem to care much about what the odds are saying about her chances of winning is Miesha Tate. A former Strikeforce women’s bantamweight champion, Tate knows what it takes to get to the top of the mountain and she’s sat in the top five of the division for years so this type of moment is nothing new to her either. She has no love lost for Rousey, who Tate spent six weeks next to during the filming of The Ultimate Fighter 18, and their personal beef is the stuff of MMA legend by now. The tension from their last fight alone left a palpable sting in the air as the two women’s fighters filled an arena with the disdain they felt for one another. This time around, however, Tate is putting Rousey’s emotional machinations to bed and instead just focusing on the fight. She’s uprooted her life in Washington to begin training full time in Las Vegas bringing in a laundry list of top women’s fighters to help her prepare for the battle ahead. There’s no vitriol ruling Tate’s life this time around – just an underlying, subliminal message embedded in everything she does these days - beat Ronda Rousey. "This is fight is as big as it gets for me. It doesn’t get any bigger, doesn’t get any better, and I’m training so hard and I feel so focused. I finally feel like I reached a point in my life where my maturity level and my skill set are on the same level finally. I feel very focused," Tate said on Tuesday. 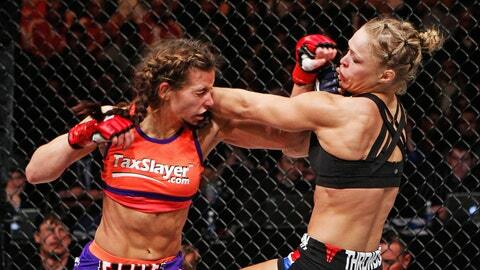 Miesha Tate’s first bout with Rousey didn’t exactly go as planned. If you examined every one of Rousey’s fights thus far, you wouldn’t find much outside of a whole lot of judo and even more armbar finishes. It’s hard to find flaw in such perfect execution time and time again, but that’s not the way Tate sees it as they speed towards their rematch next weekend. Rousey may have beaten every one of her past opponents before the first round horn sounded, but that doesn’t mean she hasn’t shown weakness and it certainly doesn’t mean she can’t be beaten. "There’s always weaknesses in a game. I think a lot of people build Ronda up to be this invincible person and there’s no way that she can be beaten, but I don’t see it that way at all," Tate said. "I see a lot of holes in her game and I see a lot of ways she can be exploited and just because it hasn’t happened yet doesn’t mean it won’t ever happen. I’m going to do something different on the 28th than anybody else has done. Those holes are there. They’re there and they’re waiting to be taken advantage of." No matter how much Tate smiles in the face of adversity or puts on a show of bonhomie leading up to the bout, she’s simmering underneath just waiting for the chance to prove everybody wrong. Most of all, Tate wants to prove Rousey wrong. I think a lot of people build Ronda up to be this invincible person and there’s no way that she can be beaten, but I don’t see it that way at all. She wants to prove that Rousey isn’t the greatest women’s fighter of all time. She wants to prove Rousey isn’t even the best women’s fighter in the UFC right now. Tate wants to put an exclamation point on this victory that leaves Rousey sitting on the floor of the Octagon sore, broken, maybe a little bloody, and sad that she’s no longer the undefeated icon of women’s MMA. "I don’t want to just win this fight - I want to WIN this fight. I want to finish this fight. I think that one thing we can probably agree on, I’m sure she feels the same way. That’s how I know it’s going to be an amazing fight," Tate said. "I know what we’re both fighting for that same common interest. We want to beat the hell out of each other, we want to finish the fight, we don’t want a decision. I don’t want a decision. So I’m motivated and I’m ready for that and I’m counting on it. I’m waiting for that, I’m anticipating it, I know exactly what I’m getting myself into. I’ve been in there with her before and for me this was just a chance to show that I’ve grown."